Here's an article from the Washington Post and the link to a video of the bus embedded in the building, ABC 7 - Building Evacuated After Being Hit By Bus. It even made Wonkette, where they concluded it was "...Yet more proof that if God had intended sensible people to go to Georgetown, he would’ve put a Metro stop there"
Actually we didn't know that a bus had hit the building until a fireman poked his head into the class and told us "Everyone out. Evacuation. 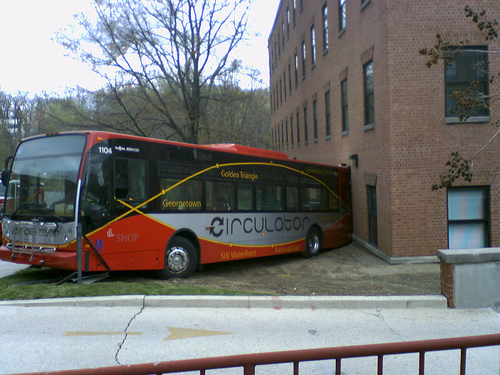 A bus hit the building". After that, we filed out of the building and rubber-necked at the scene before getting lunch. I immediately thought of the early days at my first startup, TSI/Profitlogic, where Extreme Programming in Python with Beowulf clusters was all the rage and people always talked about the danger of having low bus counts on our projects. "The bus count is the number of people on the team who need to be run over by a bus in order for the project to fail or [sic]... incur a serious cost or delay. If you have a bus count of one, then only one person knows how some critical portion of the system works and is able to maintain it. If that one person is hit by a bus, you have a serious problem dealing with that portion of the system." Here's a more mathematical treatment of Truck Numbers and another post which mentions that "as every geek knows, fate is easily quantifiable via probability calculus"
Does anybody else have any real-world examples of bus count involving actual buses?